WHEN you sign for a very big club, it can go one of two ways. You can get lost because you are open-mouthed and starry-eyed. Or you can have the full support of everyone to make you feel comfortable and you feel part of the company. 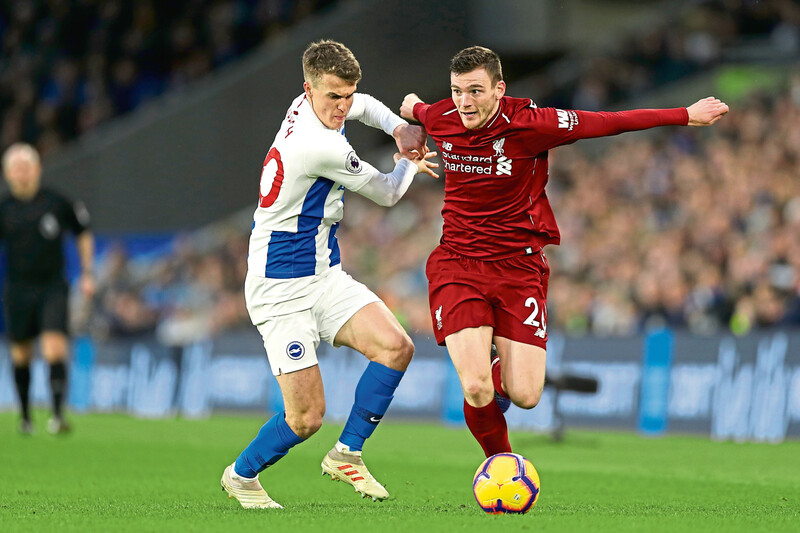 Players don’t always make their mark – but you can hardly say that about Andy Robertson. He has just committed himself to Liverpool for another five years. It is a fantastic contract for himself, and a brilliant bit of business by the club. For Andy to be where he was just seven years ago – when he was let go by Celtic – to where he is now, is a classic example to any young footballer that you should never give up and never stop believing. Indeed, to young players up and down the UK who are freed every year by the big clubs, Andy is a role model. He has displayed just what can be achieved by hard work, perseverance and dedication. Oh, and, of course, a wee bit of luck, something that’s required in every walk of life. When he was released by Celtic, he was snapped up by Queen’s Park. He then moved to Dundee United and on to Hull City in 2014. Three years later, Jurgen Klopp is signing him for £8 or £9 million. What a piece of business that’s turned out to be. That said, the size of the transfer doesn’t matter – it’s about the return you give on the pitch. His level of consistency has been reflected in this new deal. It’s a great endorsement of Andy’s ability and just what everyone at the football club thinks of him, from the coaching staff to players such as Virgil van Dijk, James Milner, Jordan Henderson and Mo Salah. I have to admit I’m delighted to see him commit his future to Liverpool. For me, there are few, if any, better than him in his position. He has excellent fitness, delivers inviting crosses into the box and gets assists. But he can also defend at the other end, as you have to be able to do to be playing in the current Liverpool team. Perhaps Andy’s ability, positional sense and tackling prowess are overlooked because of what he brings in the final third. But, make no mistake, he is as effective in one half of the pitch as he is in the other. 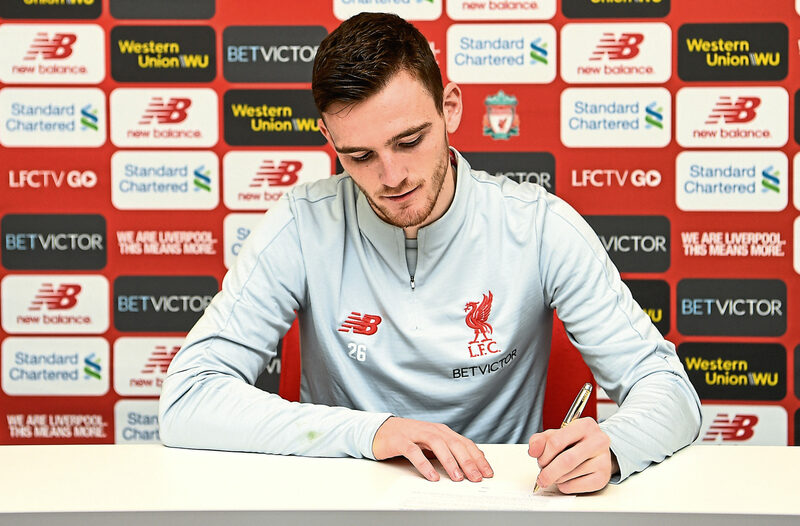 What must make it more pleasing for him is the fact that it took a while to get into the Liverpool first-team and make the left-back slot his own. He played a game here and there after his arrival from Hull City, and one of the games was a 2-0 defeat to Leicester City in the Carabao Cup in September, 2017. Andy was left out for a few games after that. But he was then given another chance and has never looked back. Obviously, he deserves credit for that but it also speaks volumes for the Liverpool dressing room and the culture and environment created by the manager. In some dressing rooms, some players might have looked at Andy and questioned his credentials to be in their company down to his CV before he got to Anfield. But the Liverpool players welcomed him with open arms and helped him settle in very quickly. All members of staff would also be doing the same for Andy. They want to see people succeed and thrive. Andy was welcomed with open arms and he has been a good addition to the dressing room because he is bubbly and lively. He is a good mixer. I’d imagine that’s one of the reasons he was made Scotland captain by Alex McLeish. You don’t need to be Einstein to be a skipper but you do need to be a decent fella – straightforward, honest and trustworthy. Andy ticks all the boxes, and when you add in his pace, distribution and delivery, you have plenty to smile about. At 24, has been capped 28 times and is first pick in his position. It would be a massive shock if he doesn’t get more than 60 caps. But over and above that depends on Andy’s fitness and the success of the team. Right now, he’ll only be concerned about what’s happening in the here and now and he can be satisfied that he is playing football for the team at the top of the English Premier League. He receives plenty accolades and nice things are said about him by people in the media and elsewhere. But the most important thing is that you are appreciated by your own manager, team-mates and supporters. Andrew is absolutely at Liverpool on merit. He is not being carried by any player or the team. He makes a massive contribution. Long may it continue and here’s hoping he has silverware with the club to celebrate in May.